Because your clients’ data and applications stored in our secure cloud infrastructure located at Verizon Terremark’s NAP of the Americas, you can provide peace-of-mind to each to your clients and establish yourself as their trusted adviser. Because your clients’ backup data will inevitably grow over time, AwesomeCloud ensures you can easily alter computing resources (storage/processing/memory), powering the solutions you offer. 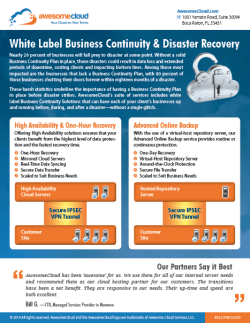 Partner with AwesomeCloud and offer white label cloud storage services to grow your managed services business. Contact us by phone at 855.2.THECLOUD, by email at sales@awesomecloud.com, or by filling out a quick contact form.